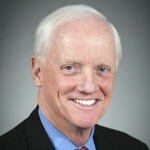 ABA President and CEO Frank Keating asks the FDIC chairman’s views on the future of community banking, cybersecurity threats, regulatory burden, too-big-to-fail and more. QWhere do you see the banking industry going over the next few years? Do you see any slowdown in the downward trend in consolidation? What can the FDIC do to help arrest this decline? AThe banking industry has been showing gradual but steady improvement over the past several years, and I would expect that trend to continue. Banks are reporting improved earnings, better asset quality, and higher loan balances. Also, the number of banks on the problem list declined to the lowest level in six years at the end of 2014. One important trend to note is that community banks are reporting greater improvement than the overall industry. Earnings at community banks were up significantly from the previous year at the end of 2014, and the pace of loan growth at these institutions were appreciably higher than the industry. So I think we have turned a corner. Banks have taken the opportunity during the post-crisis period to rebuild their balance sheets, and their capital and liquidity positions are strong. That means that banks are well-positioned to meet the expected improvement in loan demand. Consolidation in the banking industry has been a growing trend for the past 30 years. Our research has shown that most consolidation has occurred within the community banking sector. We have also found that there is significant underlying strength in the community banking model and that community banks play a critically important role in our financial system and economy. Some 93 percent of FDIC-insured institutions met our community bank definition at the end of last year, the highest percentage ever. While they hold 13 percent of industry assets, community banks account for 45 percent of small loans to U.S. farms and businesses. The FDIC is the lead federal regulator for the majority of community banks and is committed to maintaining a strong community bank sector in the U.S. financial system through our supervisory program, extensive technical assistance, and research. QWhat impact will threats to cybersecurity have on banks? What tools can the FDIC provide to help community banks protect themselves? ACybersecurity has become one of the most significant issues facing banks, government agencies, and individuals. I know it is a particular concern for community banks, and it is a top supervisory priority at the FDIC. The FDIC has been active on a number of fronts in helping to promote cybersecurity at the banks we supervise. For the past year we’ve been participating in a broad interagency cybersecurity assessment to determine how well the banking industry, and particularly community banks, manage cybersecurity and their preparedness to mitigate cyber risks. The assessment included a pilot program conducted at more than 500 community banks and technology service providers. We also work with banks to help strengthen their preparedness for a cyber attack. And we regularly alert the institutions we supervise to emerging cyber threats and discuss ways to be prepared. For example, we recently co-sponsored and conducted an interagency webinar for more than 5,000 community bank chief executive officers and senior managers that addressed management’s role in cybersecurity. As part of our ongoing effort to educate community bankers, we developed a new training program called Cyber Challenge, which is a video-based tool that allows bank management and staff to work through and prepare for common cyber threat situations. We distributed the program to all FDIC supervised banks, and it is available online. QI would like to shift your attention to the regulatory burden for community banks. A common concern of bankers is that regulators seem to cite practices of larger banks and ask smaller banks to adopt them. Is it your perception? What is the FDIC doing to address this so that the regulation is better tailored for banks of different business types? AWe do not support the “push down” of practices from larger to smaller banks. We believe in tailoring our supervision and regulation, and we seek to prevent any such “push down” of practices through regular education of our examiners and other efforts. If bankers feel that they are being asked to do something that they shouldn’t, I strongly encourage them to reach out to their regional offices, the supervisory team in Washington, or our Ombudsman’s office. We take such concerns very seriously. More broadly, the FDIC has long tailored its supervisory approach and rulemaking process to the size, complexity, and risk profile of each institution. And, we are constantly reviewing our procedures and receiving feedback through a number of venues to ensure we are appropriately tailoring our regulatory and supervisory rules and procedures where possible. As you know, we have an advisory committee of community bankers that our Board meets with three times a year to discuss a range of topics, and the input we have received from these meetings has been extremely valuable. Further, the FDIC and other regulators are actively seeking input from the industry and the public on ways to reduce regulatory burden through the EGRPRA process. EGRPRA requires the banking agencies to review our regulations at least once every 10 years to identify any that are outdated, unnecessary, or unduly burdensome. In addition to receiving written feedback, we are holding panels throughout the country to talk to bankers, community and consumer groups, and others who are interested in participating in the EGRPRA process. I have attended the two meetings we have held so far in California and in Texas and have found them enormously helpful. The FDIC already has acted on regulatory relief suggestions in response to comments we have heard during this process. First, after hearing that there was some confusion about the FDIC’s policies regarding applications for deposit insurance, the FDIC in November 2014 issued a Financial Institution Letter—or FIL—with questions and answers about the deposit insurance application process. We hope the FIL is helping potential applicants develop proposals for federal deposit insurance and is enhancing the transparency of the application process. Second, we issued another FIL in November 2014 to introduce new procedures that eliminate or reduce the requirements for institutions to file applications if they wish to conduct permissible activities through certain bank subsidiaries organized as limited liability companies, or LLCs. The prior procedures dated back to the time when the LLC structure was first permitted for bank subsidiaries. Commenters remarked, and we agreed, that an LLC is no longer a novel structure. We are confident that the new procedures will result in a more streamlined process for the institutions we supervise. QSince 2004, there have been 1,050 FILs. Some are simple, like notices of Call Reports due, but others are quite onerous, and that number doesn’t include other notices from the state, CFPB, or Fed. For community banks, this unrelenting flood of new information, guidance, rules, and changes is difficult to keep up with. Do you think there is a way to help community banks navigate this flood of requests? AWe place a high priority on communicating effectively and we are focused on helping bankers manage the flow of information. All of our FILs have a prominent community bank applicability statement so community bankers can immediately determine whether the FIL is relevant to them. We also launched several outreach and technical assistance efforts in recent years, including training videos on complex topics of interest to community bankers. We host banker call-ins on topics such as proposed new accounting rules, new mortgage rules, and Call Report changes. In addition, the FDIC offers a series of deposit insurance coverage seminars for banking officers and employees. These free seminars, which are offered nationwide, particularly benefit smaller institutions with limited training resources. Finally, I would also like to mention that as part of the FDIC’s Community Bank Initiative, we established a Directors’ Resource Center on our website to house information of importance to bank officers and directors. Included on the site are links for both risk management and consumer protection regulatory guidance, organized by topic. The site also has a regulatory calendar that alerts stakeholders to critical information as well as comment and compliance deadlines relating to new or amended federal banking laws, regulations, and supervisory guidance. The calendar includes notices of proposed, interim and final rulemakings, and provides information about banker teleconferences and other important events related to changes in laws, regulations, and supervisory guidance. We appreciate feedback on how to improve our communication. QThe overall health of the banking industry has improved considerably. Let’s look forward. What models do you think will be the most successful? Where will be the key revenue generating products for banks? AThe core business of banking is, and has always been, raising deposits from stable, local sources and making sound loans to creditworthy borrowers. There is no single way to do this well. Our research shows that the most consistently successful community banks have been diversified banks that engage in a number of different lending areas at once. As the pace of economic growth quickens and interest rates begin to normalize, we see returns for balance sheet lenders improving, on net, from the rather narrow margins they have been able to generate in the zero-interest-rate environment of the past six years. But the ability to generate revenue really begins with the relationships bankers have built with their loan and deposit customers in their local communities. QInterest rate risk has been high among your concerns. Do you feel like the industry understands this risk and is managing it appropriately? AAs a general matter, I do think bankers are aware of the potential for interest rate risk and are focused on this issue. Managing interest rate risk always presents banks with difficult choices. Reducing the duration of the asset portfolio is likely to reduce profitability today, even as it lessens the impact of higher rates in the future. We have heard from a number of bankers that they understand the importance of being patient with their earnings when making such choices. I would like to emphasize that we do not intend to lower the earnings ratings of banks that are making prudent choices to limit interest rate risk. QThe QM rule focuses on a plain vanilla mortgage loan. Do you think QM will diminish the role community banks play in mortgage lending, and limit access to credit for borrowers that do not fit the narrow box but are creditworthy? ANearly a thousand community banks still specialize in making and holding mortgage loans. During the crisis, the failure rate of these institutions was well below the industry average. And these institutions continue to lend. Mortgage loans rose nearly 6 percent among community banks in 2014 following the introduction of the QM rule in January of last year, exceeding the industry growth rate. Not only were community banks already making sound mortgage loans for the most part before QM, but the rule provides considerable flexibility for small creditors. The banking agencies have released a statement emphasizing that examiners will not subject a residential mortgage loan to regulatory criticism—either from a safety and soundness or consumer protection perspective—based solely on the loan’s status as a QM or a non-QM. The CFPB has recently proposed new definitions of “small creditor” and “rural” that will significantly expand the number of institutions that can take advantage of these more flexible provisions. I think the evidence shows that community banks have continued to be successful in offering mortgages to their customers, and I would expect this trend to continue. QLet’s turn to the ongoing debate about too big to fail. The FDIC has been tasked with implementing key provisions in Dodd-Frank to end TBTF. Do you think the measures taken will work in a future crisis? AOne of the biggest lessons from the crisis is the need for strong prudential regulation and an effective resolution framework for large financial institutions. On prudential regulations, U.S. regulators have significantly strengthened capital and liquidity requirements—particularly on the largest financial institutions–including an enhanced supplementary leverage ratio and a liquidity coverage ratio. In addition, the FDIC has made substantial progress in improving the resolvability of systemically important financial institutions. Let me outline a few steps forward we have made in the past year. As you know, the FDIC and the Federal Reserve in August sent joint letters to the largest financial firms with specific feedback on their resolution plans, or living wills. The agencies directed the firms to make significant progress in addressing identified plan shortcomings, including simplifying and rationalizing their organizational structures. The FDIC also worked with our foreign counterparts throughout the year to promote global cooperation, which will be essential to minimize disruptions if there is a resolution of a cross-border institution. The FDIC hosted a successful meeting of the heads of the Treasuries, central banks, and leading financial regulatory bodies in the United States and the United Kingdom in October. We are also actively engaged with the European Community in supporting the setup of a new Single Resolution Mechanism for Europe. Further progress was made in cross-border resolution with the International Swaps and Derivatives Association resolution stay protocol, an important step toward mitigating the financial stability risks associated with the early termination of over-the-counter derivatives contracts triggered by the failure of a global banking firm with significant cross-border derivatives activities. I don’t think there is any doubt that our new tools—both living wills and orderly liquidation authority—are dramatic improvements over what policymakers had in 2008. Policymakers should not have to choose between taxpayer bailouts or financial collapse. I believe we have a different set of options today.